You could make a lot of cash if you were a yacht captain with military training and a death wish. Defending the perimeter of a coastal estate wasn't the cushy job it was back in the twenties. But there was a certain thrill in launching a missile from the deck of a ship whose bathroom was fitted with a gold-plated sink. 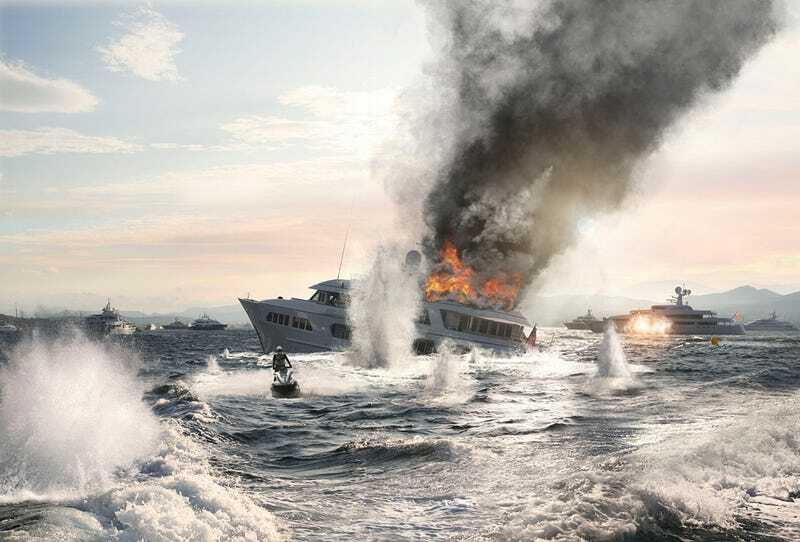 French artist Vincent Debanne created these incredible riffs on classic battle scenes, using modern-day ultra-luxury yachts, to suggest that class warfare is about to get real. Upon being appointed Dictator of the Roman Empire in 46 B.C., Julius Caesar had a large basin dug near the Tiber River. He filled it with ancient battleships and 6,000 prisoners of war, who were instructed to fight to the death as they re-enacted famous battles. Caesar called it anaumachia, and it was meant as the ultimate display of his wealth of power ... As a commentary on the growing wealth inequality, Debanne's digitally modified paintings imagines a modern day naumachia, in which the yachts of the ultra-rich go to war is to slake the boredom of their owners.